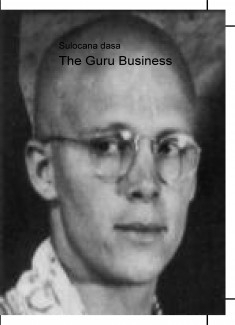 The Hare Krishna Movement had a drastic shift and its public image and rapidly membership declined inmediatly after the founder-acarya guru Bhaktivedanta Swami. In the midst of ISKCON's great turmoil, a writter was murdered in a most brutal way by a fanatic disciple of New Vrindavana's palatial in West Virginia. The take-over of ISKCON's government and control produced one of the darkest pages in contemporary religious events. Not for the weak-hearted, it's a chilling account from inside the International Society for Krishna Consciousness, involving high spheres of ISKCON in child abuse, rapes, drugs, wepon traficking and murder, using the religious institution as cover and more... Sulocana's posthumous edition exposes the sharp change in methods put in place by the "self-proclaimed gurus" after the very suspicious death of the founder-acarya Srila Prabhupada. The book is incomplete and has some lagoons, his last writtings are from two days before his murder by a fanatic follower of convicted (now free) New Vrindavana guru Kirtanananda Swami. the text is quite unedited, as Sulocana kept on writting just up to the day of his assassination. This is a good example of how a comunalistic institution can be deprived from its communal opinion (istaghosti) and be turn upside down into a very authocratic extreme right governing body. For high-control groups and cultic researchers, it's a rare first-hand account of a commited writter, trying to save his guru's assets from the hands of what Srila Prabhupada called "infiltration" destroying ISKCON from inside. It's easy to take over high control groups since all you have to do is take over the "government." 346 pages of shocking revelations on hidden aspects of ISKCON's gurus, whose authenticity is greatly compromized. Sulocana saw a tip of an Iceberg, but this tip is enough to take review of hidden serious abuses and crimes perpetrated against unprotected faithful members of closed religious groups and high-control groups.